Inventory We are a resale marketplace, not a box office or venue. Ticket prices may exceed face value. This site is not owned by Rochester Auditorium Theater . 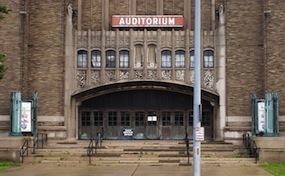 The Rochester Auditorium Theatre was built in 1928 at a cost just over $2.2 million. The Rochester Auditorium Theatre box office is located at 885 East Main Street in downtown Rochester, New York. The theater provides a seating capacity of 2,464. The Rochester Auditorium's Masonic Temple went through a complete renovation in the summer of 2003, including new carpeting, seats, and upgrades to the bathrooms. Rochester Auditorium Theatre tickets have included such smash traveling Broadway shows like The Phantom of the Opera, Wicket, The Lion King, The Producers, and Miss Saigon. The auditorium is brought to life by the powerful 1,619 pipe Wurlitzer theatre organ. RochesterTheatre.org is not affiliated with any official website, box office, or primary supplier. We are independently owned and operated and provide access to all events in the secondary market. Ticket prices on our sites may be below or above face value and will fluctuate with the market. To purchase tickets to all Rochester Auditorium Theatre events simply follow the instructions online or for further assistance call our operators at anytime.